When you're way off the beaten path the last thing you should worry about is how you're getting home. Introducing Rough Country's Forged Adjustable Track Bar for Jeep XJs, ZJs and MJs. This massive 16lb Track Bar is nearly twice the weight of your factory Track bar, offering you unparalleled support and the ultimate peace of mind in any driving situation. 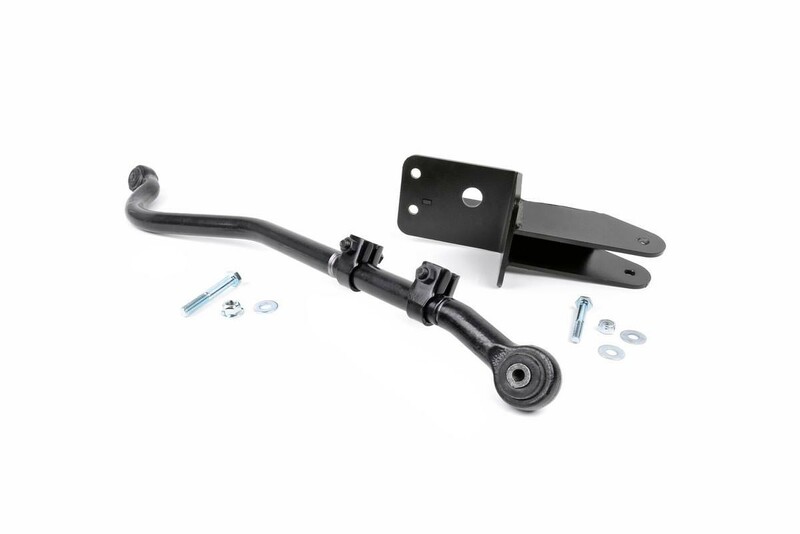 For those who are serious about flexing, crawling, and pushing your Jeep to the limits, Rough Country's Forged Adjustable Track Bar is a must. This new track bar is made of forged steel and features rubber Clevite bushings and a beefy construction that will dwarf stock equipment. This design allows the bar to keep your axles tame even under pure off-road torture. Fits models with 4 - 6.5in suspension lift kits. Requires a drop pitman arm.